Fig. 1. 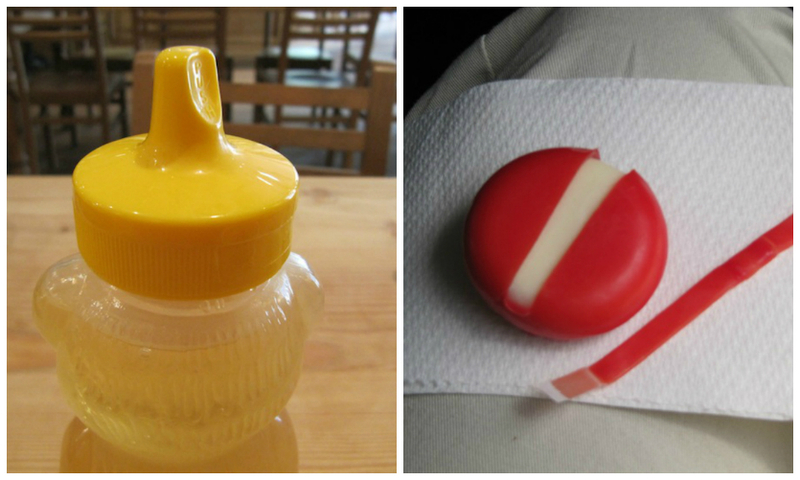 The simple “zippered” cheese wheel incorporates important visual/tactile cues. Fig. 2. 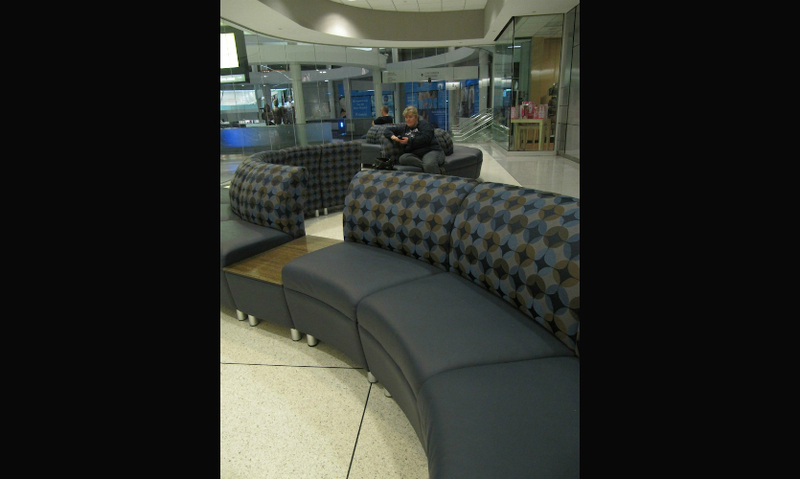 This airport lounge furniture demonstrates concepts of systems thinking. Fig. 3. Some primarily utilitarian designs include adjustments or elaborations that enable them to blend in, enhance, or contrast with their given contexts. Fig. 4. Vastly different applications can share similar design approaches, such as monochromatic visual cues and implied direction. Fig. 5. The honey bear and cheese wheel share monochromatic visual cues, subtle tactile cues, and user feedback in the form of change in color or position. Fig. 6. While their functions are quite different, the honey bear and overhead airplane storage compartment share visual cues affected by lighting and tactile surface changes. Fig. 7. 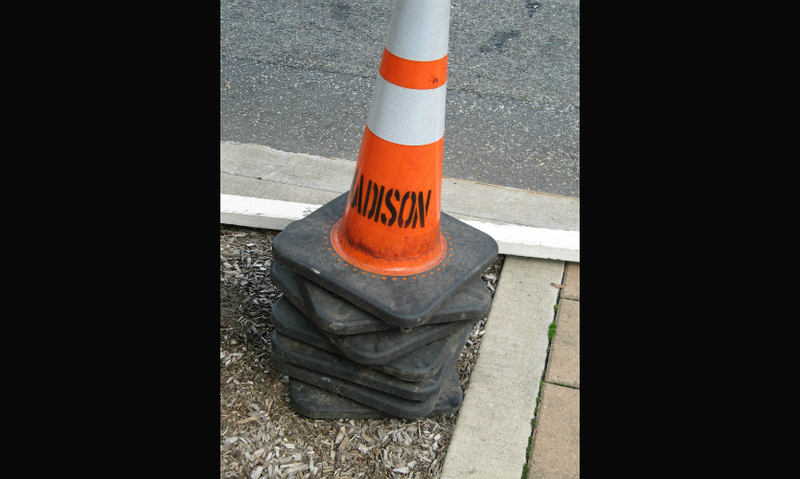 Color, texture, and material contrasts were chosen to enhance safety. Fig. 8. Design of the airport baggage cart acknowledges incidental uses and people priorities. Fig. 9. The window design integrates the options of adjustability, implementation ease, range and degree of choice, and manageability. Fig. 10. The green trash bin integrates the notion of site-specific elaboration. Fig. 11. The acknowledgement of dormancy allows for modularity, use of available space, and ease of storage. Fig. 12. 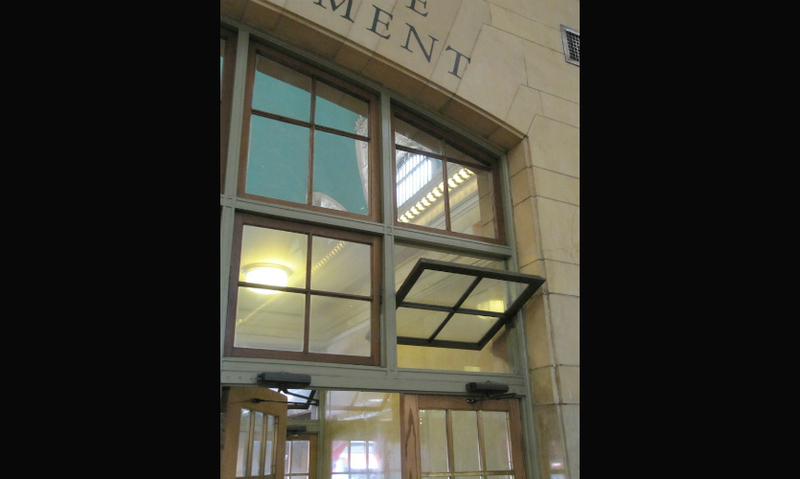 The ubiquitous exit sign shows how visual cues (material and surface choices, legibility, etc.) can enhance accessibility. Fig. 13. 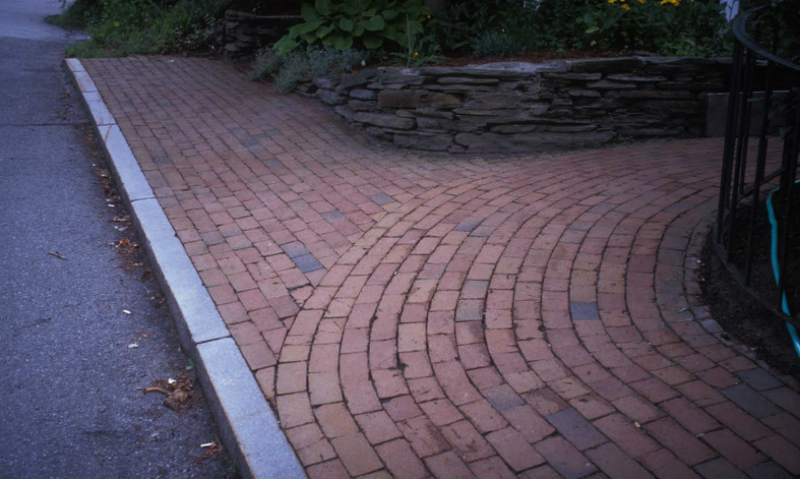 These sidewalk pavers demonstrate how design decisions can help users translate the visual implications of the physical space. Age and physical ability are natural filters for assessing the successes of designed objects, messages, and experiences. 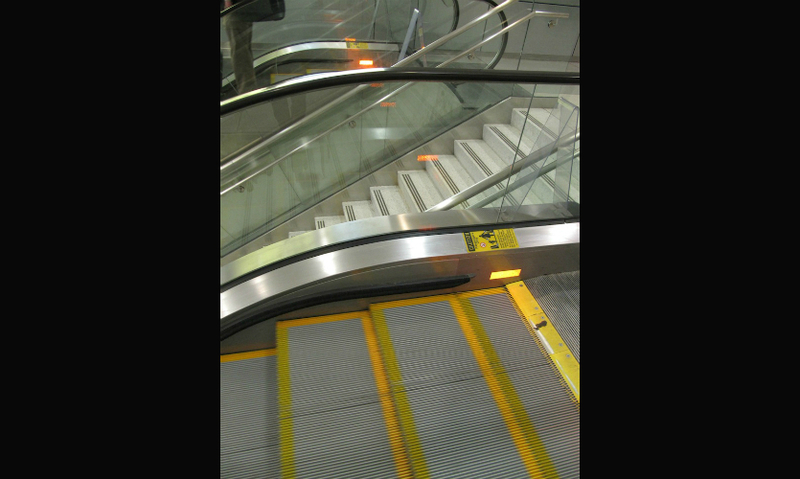 Design problem solving contributes (or not) to the resolution of challenges faced by aging and/or physically challenged individuals as they interact with products and contexts in the built environment. 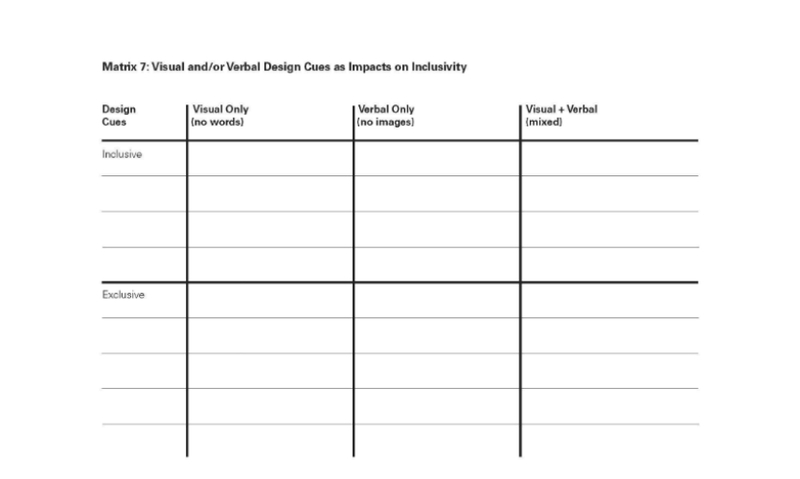 This paper examines some design details, solutions, and situations that impact everyday inclusivity and quality of experience, and suggests approaches toward understanding and increasing interaction success for all of us. Can existing successful design decisions be identified, and then reinterpreted and/or elaborated for purposes and contexts that focus specifically on age and/or physical ability considerations? 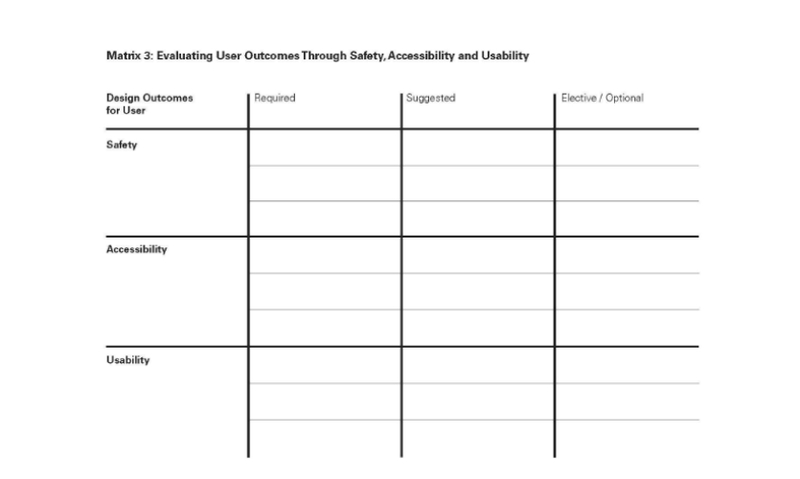 The interpretive and generative matrix structures proposed here demonstrate ways to organize and systematically compare goals and examples that have potential influence on human-centered and inclusive design outcomes. What includes, and why? What excludes, and why? Many of the examples chosen for this discussion are commonplace, if not ubiquitous. 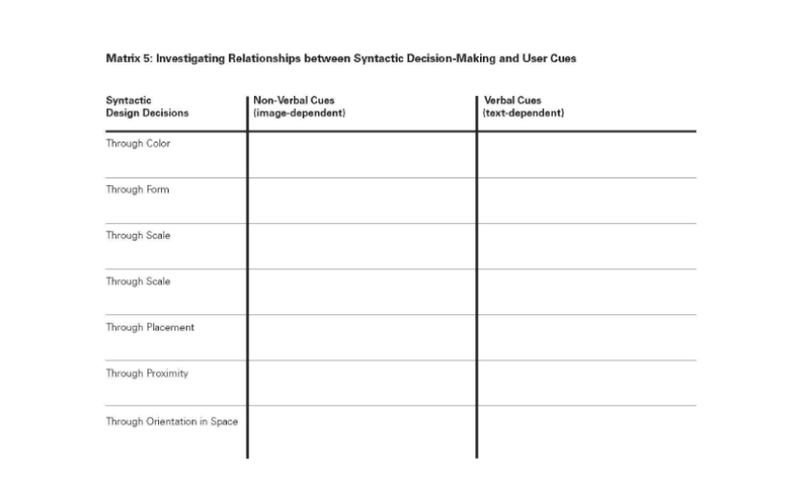 The proposed matrices enable examination of examples from different vantage points, and across diverse factors, affordances, and relationships. Varied configurations provide nuanced approaches for understanding these examples and defining relevant categories. The comparisons presented in this work are intended to initiate an evolving platform for the discussion and development of design education strategies and content that prioritize aging and physical ability issues. Some familiar macro and micro examples have been chosen to illuminate everyday user interactions, challenges, and considerations. Ideally, increased exposure to these aspects, through audience-, age-, and ability-related projects, courses, and curriculum, will strengthen awareness and empathy in young design students, and encourage thoughtful, and more inclusive, design in the future. Design problem solving has the potential to contribute wonderful spirit and ease of use to the tasks and challenges we face every day. Sometimes design process results in high quality decisions. Sometimes it doesn’t. Age and physical ability considerations are natural filters for assessing certain successes and impacts of designed objects, messages, and experiences. This paper examines a selection of design details and situations that impact everyday inclusivity and quality of experience. Through proposed matrix structures, it also suggests approaches toward understanding, and potentially increasing, interaction success for all of us. This work centers on connecting expertise in design, design education, and methodology with commonplace experiences and challenges encountered by aging and/or physically disabled individuals in the built environment. The design process and overall exploration involved here continuously adds to the understanding and awareness of user needs and concerns, particularly in these two arenas. These activities (observing, selecting, and analyzing found examples) have gained further momentum and significance as I find myself in various support roles for older relatives and friends. Visual examples have been gathered for a range of reasons, and from various locations. There are many ways to view and connect examples. Some shared characteristics and differences are investigated here. Assessed strengths and weaknesses have both offered valuable focal points for discussion. At this time I am focusing efforts toward continuing to increase my understanding of this emerging content area, and identifying ways in which I can connect these observations with relevant design process and methodology for eventual use in design classes and professional presentations, and to inform professional practice. What overarching criteria was I tuning in to for this paper? Where was I looking? What were some primary contexts for example gathering? Why have I highlighted specific examples? How and why am I organizing and reorganizing these examples? Macro and micro design decisions, and their impacts, are threaded through our everyday experiences. Although many of the design decisions we encounter work reasonably well for most of us, there are many design solutions we interact with that aren’t high quality and don’t come close to performing as well as they could. We’re all familiar with some degree of compromised experience (i.e., hard-to-read instructions, doors that are difficult to open, places that are challenging to navigate, and generic or unappealing spaces). 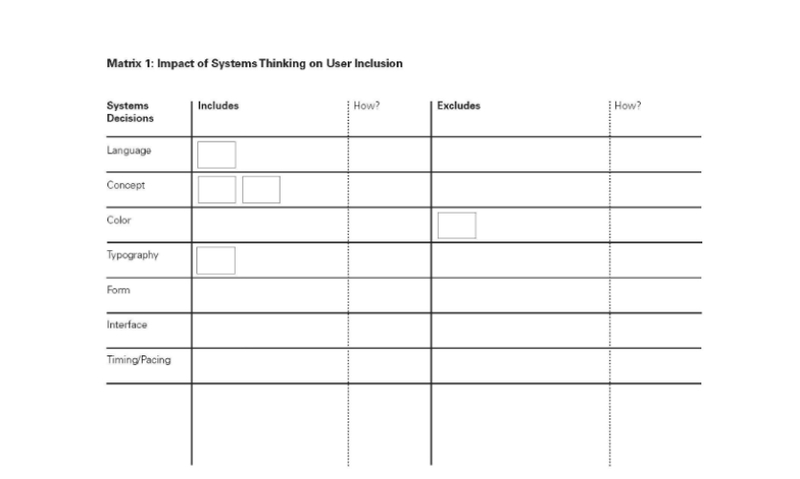 Many factors influence these user interfaces and outcomes. Through a combination of intuitive and systematic involvements, certain identified themes and concerns have begun to surface from the broader work as priorities for further investigation. This paper presents a range of these themes as they relate to the discussion of quality of experience and inclusive design. For example, one theme focuses on the integration of visual and tactile cues. Another set of examples centers on employing system thinking and modularity decisions. A third set relates to enhancing pragmatic, utilitarian solutions, and so on. The decision to focus on “quality of experience” and “inclusiveness” alongside “age” and “ability” has been complex, but productive. These are not entirely new themes or challenges for designers. This work focuses on closely examining everyday interactions to see how they may be relevant as potential influences for improving design outcomes related to aging (specifically advanced age, the elderly) and ability (specifically differences in physical ability). Many of the examples chosen for discussion are commonplace, if not ubiquitous. The ongoing collection of examples has helped to establish a unique range of contexts and categories, and the concurrent development of multiple matrices has offered diverse ways to systematically cross-reference relevant attributes and factors. Selected examples and matrices from the larger overall effort are included and discussed within this article. This is intended as forward momentum, not as a finite, conclusive study; there are many other directions, connections, and applications for this work beyond the scope represented in this paper. What includes, and why? What excludes, and why? This effort examines specific categories of design decisions and suggests the development of different matrices as a method for first comparing the attributes and original goals of existing solutions, and then possibly identifying ways to apply these findings toward future design development. Matrix formats are in use across disciplines and for many purposes. 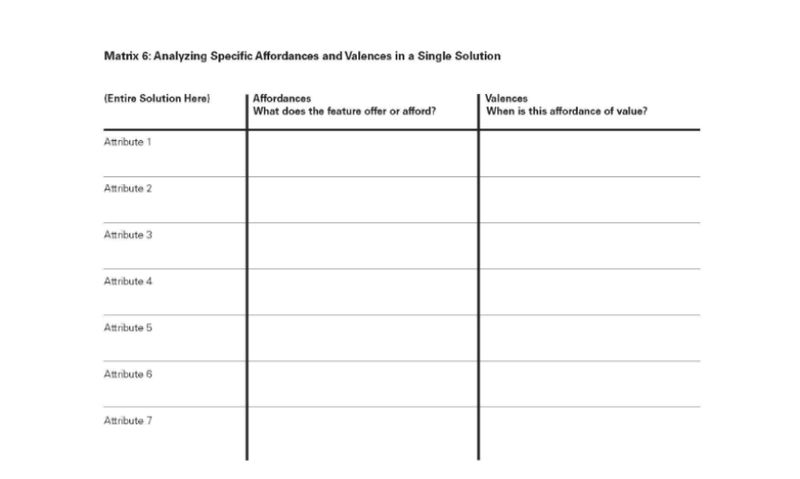 The matrices proposed here represent a few specific models and strategies to share with students as they engage in the process of identifying and organizing a larger set of observations within the built environment. 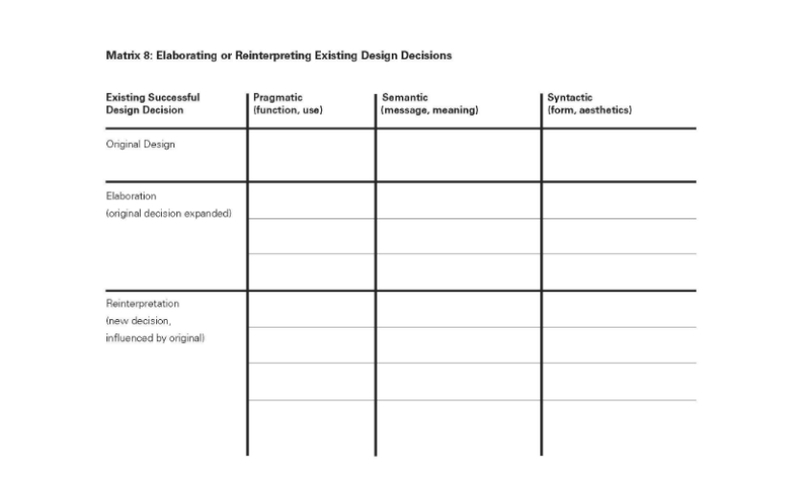 In addition to learning from the “portals” created by categories of existing successful (and less successful) design decisions, this work also demonstrates ways to employ found examples as “springboards” for future decisions and solutions. Could some of these solutions, originally intended for more generalized audiences, be “translated,” reinterpreted and/or further elaborated for purposes and contexts that focus on inclusivity and age and/or physical ability considerations? Interpretive and generative matrix strategies are also defined here. These matrices enable examination of examples from different vantage points, and across diverse attributes. Varied matrix configurations provide different nuanced approaches for understanding solutions and defining relevance. So often it appears that designed environments don’t fully incorporate the highest “usability” standards for any of us. Spaces are confusing; interfaces with products and visual communications are awkward or ambiguous. Many factors such as expertise, cost, demand, and manufacturing influence these outcomes, and subsequently impact our independence, success, and satisfaction in everyday activities. Though not always emphasized in every kind of design project, planning with age and physical ability as priorities helps establish some of the highest standards in design. U.S. Census data, media reports, and professional entities such as LeadingAge, Open Doors Organization, and others further support the proposition that design solutions that prioritize inclusivity and quality of experience are highly relevant to our current times. In addition to helping us all, they have specific and direct impacts on evolving ADA standards, expectations, and outcomes (for people of all ages with physical disabilities, as well as current elder populations), and on the aging “Baby Boomer” populations that are rapidly increasing in number. Familiar design solutions (either in whole or in part) can be used as unexpected and positive influences for advancing problem solving beyond the purposes and audiences for which they were originally intended. The same design solutions that many of us take for granted can be closely examined and analyzed from many conceptual angles. The compilation of visual examples identified several everyday, basic design approaches that could have broader implications for other contexts and solutions. Could some of these decisions be further incorporated into design solutions for other purposes and user groups? Could these kinds of intentions be further emphasized and integrated as new solutions are developed for particular individuals or user groups? Could additional decisions such as these be used to advance products and environments beyond generic or unnecessarily stark implementation? In addition to examining single examples, the juxtaposition or comparison of multiple different examples is also useful. 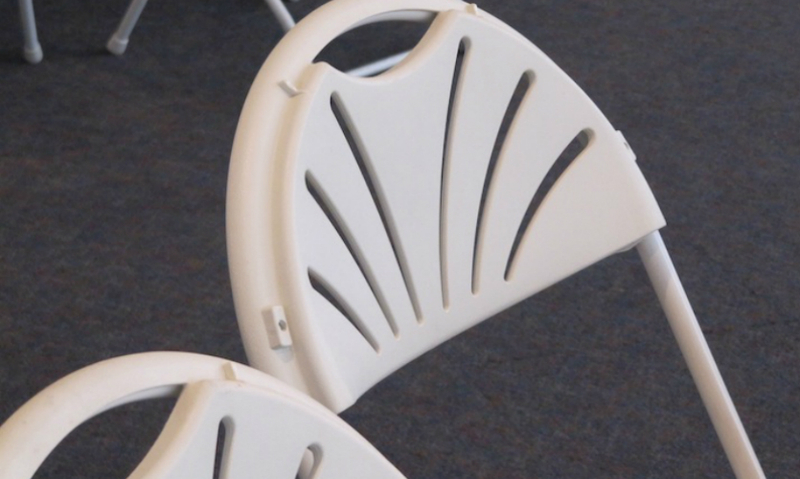 One design solution may distinctly inform the ways we look at other problems and solutions. 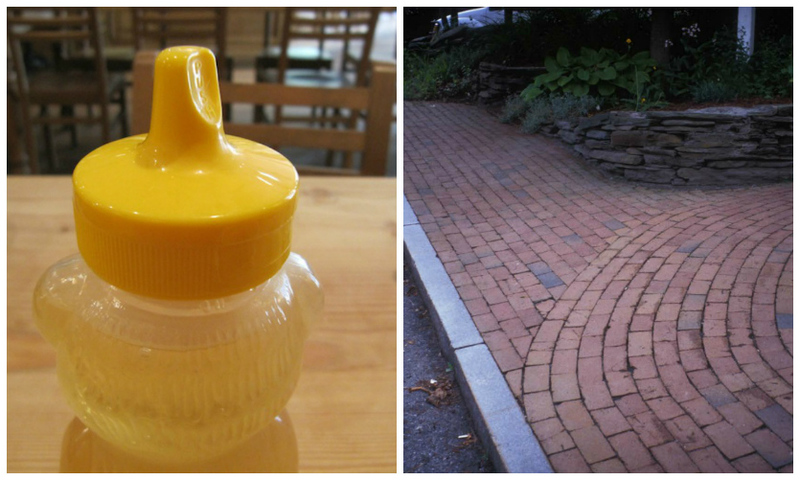 Figure 4 is an example of how vastly different applications—in this case, a honey container and sidewalk pavers—can share similar design approaches such as monochromatic visual cues and implied direction. Figure 5 extends the idea. The honey container and cheese wheel share monochromatic visual cues, subtle tactile cues, and user feedback in the form of change in color or position. 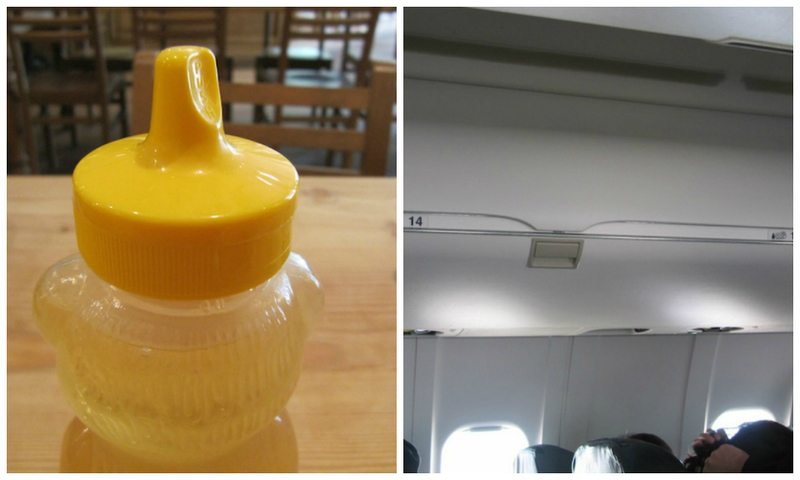 The visual examples in Figure 6 (honey container and overhead airplane storage) share visual cues affected by lighting as well as tactile surface changes. 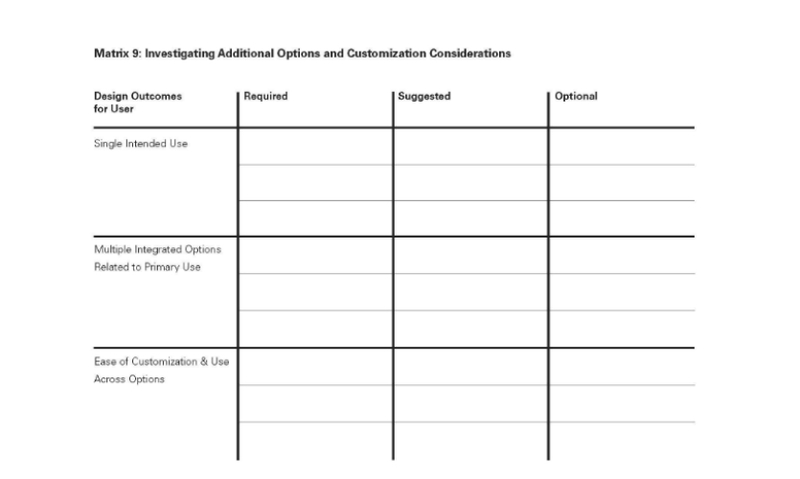 An interpretive matrix focuses on categorization, comparison, and interpretation across existing examples for the purpose of organization and analysis. In this work, interpretive matrices were formatted to aid in the understanding of existing designed objects, messages, and experiences in everyday built environments. Examining existing solutions and their details in this way provides a structured, systematic means for assessing strengths and weaknesses, observing and evaluating attributes and relationships, and prioritizing goals for further design advancement. A generative matrix focuses on the generation and development of new design solutions and approaches based on specific sets of identified goals and objectives. In this work, generative matrices were formatted to primarily focus attention on the design of new objects, messages, and experiences that could potentially increase quality of experience and inclusivity within the built environment in various ways. Matrix responses can be a combination of visual and/or verbal entries as useful and appropriate, and any of the sample matrices that follow could be used in either an interpretive or a generative mode. Interpretative and generative matrices can also be useful influences on one another. Inherent goals can be shared across both modes as relevant, and feedback loops (where something discovered in one phase or within one matrix can be integrated to incorporate useful attributes or findings across either foundation). 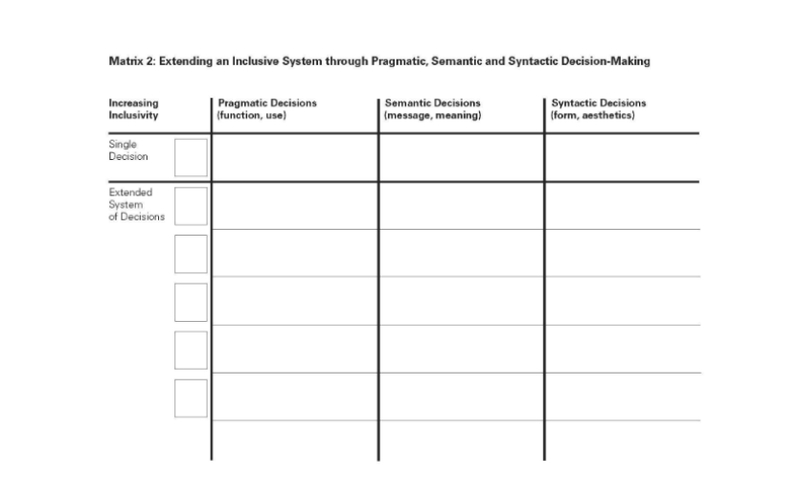 Each matrix included here establishes different levels and priorities of relationship and connectivity across examples. The axis variations across matrices provide nuanced understandings of examples, as well as different ways of defining relevant categories and comparisons. The matrices shared here include different vantage points for consideration, such as inclusive and exclusive assessment; elaboration or reinterpretation opportunities; safety, accessibility and preference; contextually congruous or incongruous site integration; and verbal/non-verbal cues. 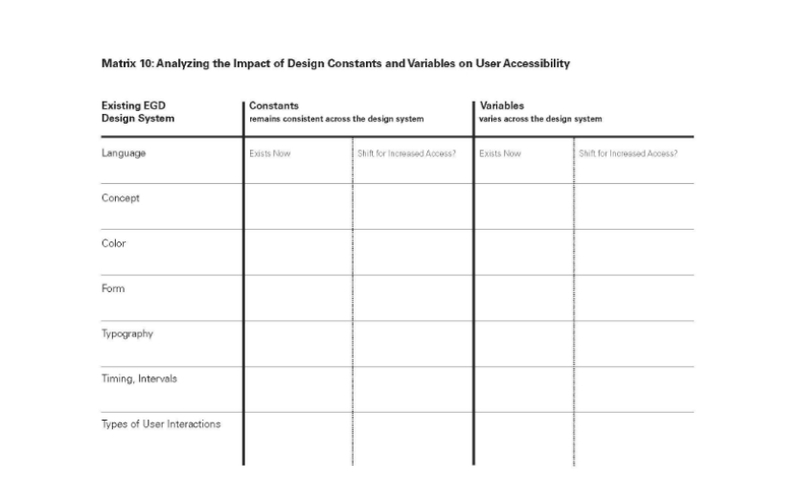 They also compare examples across diverse factors, such as systems decisions dealing with language, color or concept; design decisions related to aspects such as scale, proximity, and orientation; and assessment of constants and variables. They encourage cross-referencing of affordances, such as pragmatic, semantic and/or syntactic considerations; required, suggested, or elective uses; single vs. multiple intended uses, etc. Process phases and feedback loops are mutually beneficial in design planning and development. Gathered examples can prompt particular new matrix development—as the basis for establishing sets and subsets of examples, and for prioritizing key points for relevant cross-referencing within a particular format. As additional examples are assessed and added in, clear commonalities and contrasts begin to surface. Conversely, establishing goals for a new matrix upfront (before examples are identified) can also be useful. In this way speculative goals and priorities are tested, and can always be modified, once examples gain in number. Matrices accommodate and encourage meaningful incremental change, reinterpretation of preexisting solutions, and entirely new design development. Employing this method uncovers unexpected relationships across multiple entries to expand investigation and productive iteration. Systems relationships among specific details or across entire solutions are potentially highlighted through this process, and provide flexibility and insight related to constants and variables as they impact use and customization possibilities. Writing this paper has provided further opportunity for the investigation of commonplace design details, solutions, and situations and their potential connections to age and ability considerations. 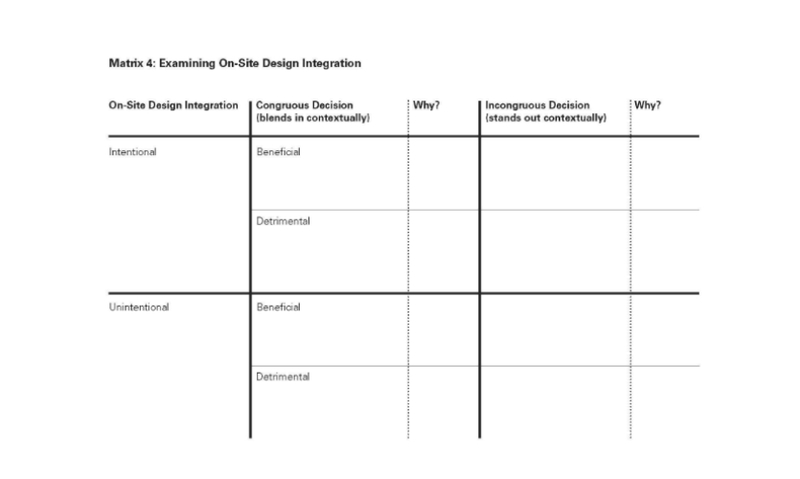 The comparisons presented in this work initiate an evolving platform for the discussion and development of design education strategies and content that prioritizes these goals. New strategies and models for categorization and prioritization have surfaced, along with additional themes that may have either been overlooked or under considered in the past. These efforts all provide possibilities for further discussion and development, and also offer potential benefits to other kinds of design projects and user groups. in other ways within our everyday existences, and for many more people. Surprisingly, simple details and decisions from smaller and/or quieter solutions often contribute to higher quality user experiences and provide thought-provoking prompts for consideration. Attributes and affordances don’t need to be complicated to be important. Sometimes the more subtle solutions are “economical” in unpredictable ways related to value, time, energy, and materials. Whenever intentions and strategies are focused on quality of experience and/or inclusiveness, they offer potential benefits across diverse contexts for both individuals and communities. Differences across users and audiences represent important standards and expectations for design problem solving. This proposed assessment of everyday experiences, design solutions, and impacts is important and timely. Providing pedagogical methods and channels for objectively and subjectively interpreting and understanding ways in which people can be included or excluded is imperative. Ideally, increased exposure to these considerations and approaches, through audience-, age-, and ability-related design projects, courses, and curriculum, will strengthen awareness and empathy in students, and encourage necessary cross-disciplinary respect and collaboration as well as thoughtful, and more inclusive, design contribution in the future. Prioritizing this subject matter with the intention of increasing the quality of our everyday experiences is a nuanced and worthy goal. Deborah Beardslee is an Associate Professor in the School of Design at the Rochester Institute of Technology in Rochester, N.Y. She primarily teaches and develops coursework related to EGD, information design, methodology, and design systems. She has served as coordinator for the MFA Program and as chair of the BFA Program, and is actively involved in curriculum development within RIT’s Vignelli Center for Design Studies. In support of local community, Deborah is a member of the City of Rochester’s Preservation Board, the Seniorsfirst Board of Governors, and the Board of Directors for Valley Manor, a senior independent living facility. Her research involvements focus on systems thinking, design process, cross-disciplinary collaboration, experiential graphic design, and design effectiveness across age and ability considerations. She presented a portion of her work in November 2013 at the third annual interdisciplinary Common Ground Aging and Society Conference in Chicago. 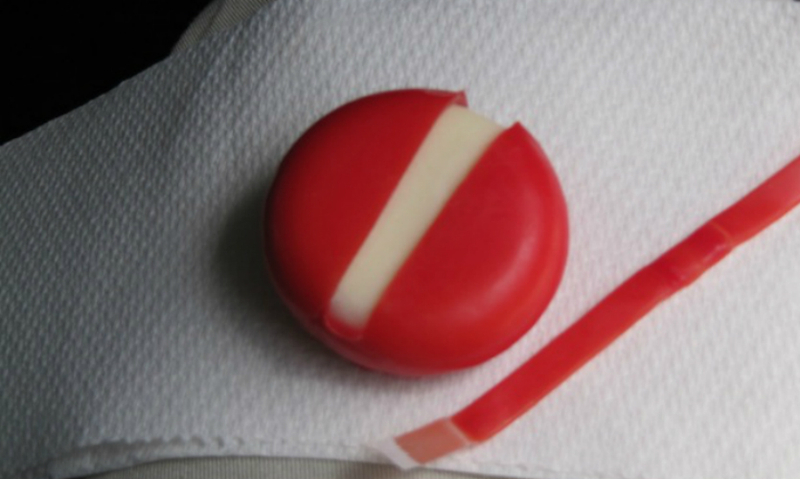 The simple “zippered” cheese wheel incorporates important visual/tactile cues. This airport lounge furniture demonstrates concepts of systems thinking. Some primarily utilitarian designs include adjustments or elaborations that enable them to blend in, enhance, or contrast with their given contexts. Vastly different applications can share similar design approaches, such as monochromatic visual cues and implied direction. The honey bear and cheese wheel share monochromatic visual cues, subtle tactile cues, and user feedback in the form of change in color or position. While their functions are quite different, the honey bear and overhead airplane storage compartment share visual cues affected by lighting and tactile surface changes. Color, texture, and material contrasts were chosen to enhance safety. 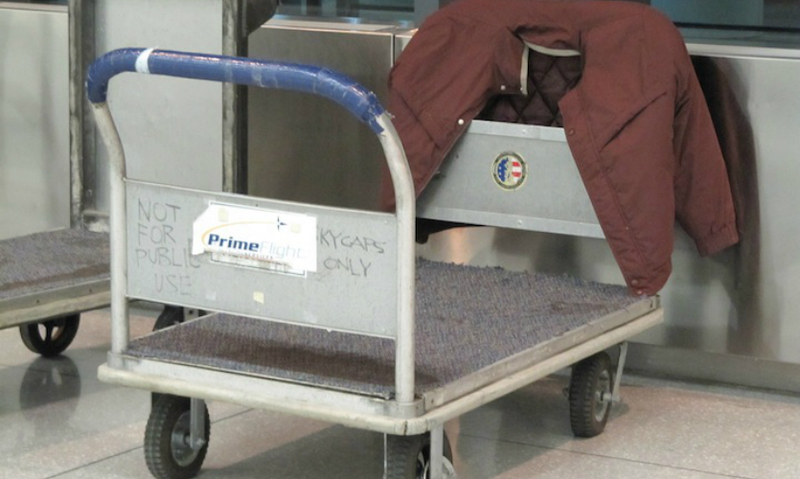 Design of the airport baggage cart acknowledges incidental uses and people priorities. The window design integrates the options of adjustability, implementation ease, range and degree of choice, and manageability. 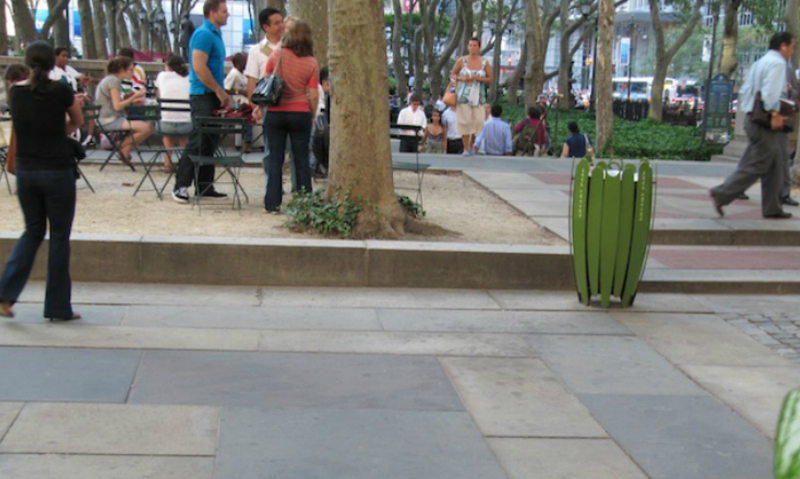 The green trash bin integrates the notion of site-specific elaboration. The acknowledgement of dormancy allows for modularity, use of available space, and ease of storage. 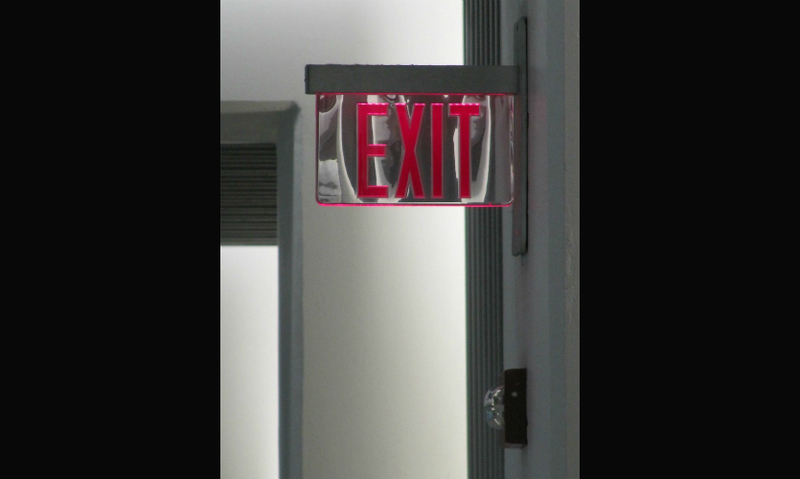 The ubiquitous exit sign shows how visual cues (material and surface choices, legibility, etc.) can enhance accessibility. These sidewalk pavers demonstrate how design decisions can help users translate the visual implications of the physical space. 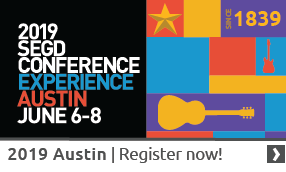 Find more content in your areas of interest in the SEGD Xplore Experiential Graphic Design index.